What’s with the word “amazing” these days? I am so sick of it! Any question I ask about how something looks, tastes, feels, was or, in the case of a person, is, I get the same canned answer: amazing! “It was amazing!” “The food was amazing!” “She is amazing!” The weather for this time of year, your sister’s vacation to Hungary, your daughter’s first-grade teacher, your new hairstylist’s foiling techniqe, the sale at The Children’s Place–and, of course, whoever happens to be singing for Paula–all of them, amazing. I think our love affair with “amazing” must have something to do with our shoddy collective vocabulary (and I certainly include myself in this generalization.) “Amazing” covers it all: nice, good, fun, interesting, exciting, different, competent, even above-average. A mediocre event can even slip into the amazing category on a good day, because the person describing the event may only know one word with which to describe it (that word being the only adjective heard on t.v., especially reality t.v. ; the fact that I know this may explain the shoddiness of my own vocabulary). In fact, I set this whole mess squarely on Paula Abdul’s shoulders, whom I think should file a patent for the word. Maybe we should all just ‘fess up and substitute “amazing” with “awesome,” the Reagan-era equivalent of “amazing.” After hearing awesome! in every other sentence, we’d realize how ridiculous we sound doing the same thing with amazing! And we’d realize that when we term everything “amazing,” nothing really is. 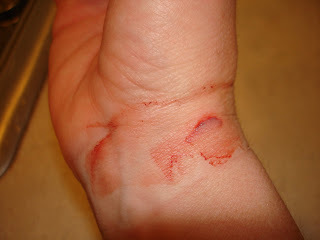 I’ve griped now. I feel better. With gifts like these, who needs weapons? Peeking around the kitchen door, however, I saw that Derrick had on his LIE FACE (a sort of smirk/scowl thing that makes him the world’s worst liar) and so I knew the game was on. On Mother’s Day I opened up not just any ‘ole knives, but several pieces of the Wusthof (“voosthoff”) collection – much nicer than the knives I’d asked for, and heavily researched, weighed, and measured by my adorable husband. 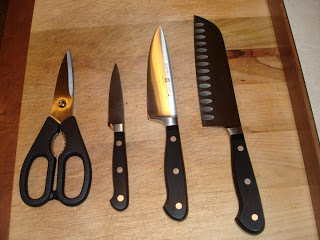 Apparently, these are the only knives that Derrick’s Grandma Dollie will slice with. If you know Derrick’s Grandma Dollie, you know this is big (she orders her flour from Canada–need I say more?) Derrick delivers again with a perfect, (semi) romantic gift! I’m one lucky lady.